Here’s a summary check-list for driving in snow and icy conditions and a few links to websites where you can get more detailed advice. First – Is it really necessary? Do you have to drive in these conditions, can it be postponed? 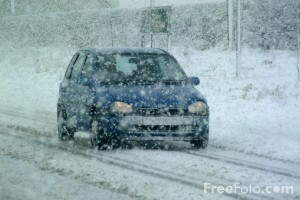 Listen to traffic news and if the police are saying do not drive unless it’s absolutely necessary then don’t. But if you’re a learner and your driving instructor is prepared to take you out then they’ve assessed the conditions and decided that it would be good practice for you (after all a driving instructor is not going to risk losing their car in a bump, or worse – it’s their livelihood). In this country we don’t get these conditions very often (fortunately) so it could be a good opportunity to learn how to cope. Keep plenty of fuel in the car; make sure your tyres are in good shape, inflated to the right pressure – including the spare; take warm clothing with you and something to eat and drink in case you get stuck or break down; make sure your mobile phone’s battery is fully charged and you have enough credit on your phone. Clear ALL the windscreens and mirrors of ice and snow and if you have a layer of snow on your roof, clear it because it will slide off whilst you’re driving and cover your windscreen. 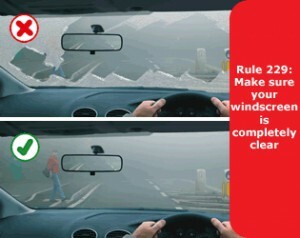 Similarly if you have snow on the bonnet, clear it, because it could blow up all over your windscreen as you’re driving. It is illegal not to be able to see all round as you’re driving (and stupid!). If you have air-conditioning put that on to help keep the inside screens from misting over. Keep a sensible distance from the vehicle ahead (stopping distances are 10x more in icy conditions, the 2 second rule becomes a 10 second rule). Avoid braking if you can, but in any event brake gently and go down through the gears to slow the car down. No sudden braking and no sudden steering movements. If parked on snow move off in 2nd gear instead of 1st.